So, it appears, quite rightly, as an article of faith in the Creed: “We believe in one, holy, catholic and apostolic Church.” Now, what do we mean by “article of faith”? It is a supernatural truth that is revealed by God. What makes this article of faith unique is the fact that many Christians dispute and deny the Church to be something supernatural, something as an article of faith. Church as a Supernatural Truth Revealed by God is Denied by Protestants. Bible Christians believe, just as we Catholics do, in God the Father Almighty, Creator of heaven and earth. They believe that Jesus Christ is His only Son, Our Lord. They believe that He was born of the Virgin Mary, “He was conceived of the Holy Spirit, born of the Virgin Mary, He suffered under Pontius Pilate”. They believe in all of that. They believe in the Holy Spirit. Bible Christians who are Protestants, we could say, believe in the Father, the Son and the Holy Spirit. They will also confess their belief in “one holy, catholic and apostolic church”; only they will define those Notes (marks), those terms in strictly natural, non-supernatural ways. They will describe or they will confess their belief in a church, which is ultimately not something that is a divine organism. They believe in the miraculous conception and birth of Jesus, His passion, death and resurrection, the personhood of the Holy Spirit and all of that; but they diverge from us when it comes to understanding the one, holy, Catholic Church and the Communion of Saints. They don’t deny the propositions; rather they reduce these articles down to the natural level of being mere human realities or being divine only in the sense of being spiritual and invisible. So there’s a spiritualizing tendency, so that the Church is one only in a spiritual, invisible sense. By spiritualizing the Church, many non-Catholics do away with any reality that is visible, any visible unity for the Church as a worldwide family of God. They also de-supernaturalize the Church as it is visible, that is, in the congregation or in the convention or in the denomination; these things they say, quite rightly I believe, are mere human conventions and so they naturalize the Church; whereas the Catholic conception, going back to antiquity, to the Fathers and to the New Testament itself, is that the Church has a human element, to be sure. It consists of us sinners, but it also has a divine element, a supernatural reality, which is properly speaking, the object of our faith. If you try talking about this matter with Bible Christians, with Protestants, with non-Catholics, I think you will see, you will notice an emerging pattern of uncomprehending responses. “What do you mean the Church is a divine organism? What do you mean it’s a supernatural, sacramental body?” It is the Body of Christ, Protestants believe, but that “Body of Christ” is a metaphor. It is not a metaphysical, theological reality that in any way is visible, like a body is normally understood to be visible. You will probably feel a sense of inadequacy in dealing with those whose faith cannot extend to the Church, because the vast majority of non-Catholic Christians put their faith in the Father, Son and Holy Spirit but not in the work of the Holy Spirit, which is the one, holy, catholic and apostolic Church. At times, it will almost feel in your conversations that there is no common denominator. You will talk to a person outside the Church about the Church, and it will seem like you’re living in different worlds. You will feel powerless to penetrate a natural mindset, which denies the supernatural reality of the Church by mere argument. It’s like trying to describe color to a blind man. It seems like we don’t share the same language. What’s most important for us as Catholics, however, is to remember that what enables us to see the supernatural truth and reality of the Church so clearly, is not our intelligence. It’s not our experience, but rather, the faith that is a gift of God. Our faith is from beginning to end, a gift of God. Fulton Sheen gives an illustration. Think of the most beautiful stained glass cathedral windows and how different their appearance to insiders is from outsiders. Standing on the outside, the windows appear to be a meaningless mass of lead and dull colors, but their beautiful colors and vibrant designs captivate you once you step inside. The higher truth of the Church is like that, like the glorious Host enthroned upon the altar. One man sees a wafer, while another sees the Eternal God made man under the form and appearances of bread and wine. The reason for the difference is the light of faith. This scandal, this stumbling block is an extension of the same scandal or stumbling block that Jesus presented 2000 years ago. One man would see a 33-year-old Palestinian Jew with incredible and extraordinary wonder-working powers, while Peter would see the Son of the Living God. Jesus would have to remind Peter. He didn’t say, “Dumb people don’t understand, but you’re so intelligent that you do”. He said, “Flesh and blood haven’t revealed this to you but my Father in heaven”. You cannot see Jesus to be the Son of the Living God apart from the gift of faith. You cannot see the Church to be the Bride of Christ, the Mystical Body of Christ, you cannot see it to be a supernatural organism whose soul is the Holy Spirit apart from the same gift. So we do not go about defending this view, simply by natural reasoning. It would be futile, in vain. Like an X-ray, faith sees beyond mere appearances to discern the interior reality hidden from view within the Church as the Mystical Body of Christ. This view of the Church, what it is in its inner reality, is not the result of popular consensus or common conviction or majority vote. Rather, faith believes what it does, faith is what it is, quite simply because God reveals it to us and gives us the grace to believe it. Consequently there are not many faiths corresponding to many denominations. There is only one faith, just as there is only one truth, as St. Paul says, “one Lord, one faith, one baptism”. Jesus did not say, “I will teach you the truth like Moses did, I will teach you the truth like Solomon shared his wisdom”. He said, “I am the truth”. Likewise, Jesus also said, “Upon this rock, I will build my church” (Matt 16:18), not “my churches”. And upon this rock (He was speaking of Peter) He built His Church, and He continues to build the Church. And the Church is from beginning to end, the work of Jesus Christ. So, when we exalt the Church, when we elevate its greatness, when we focus our attention upon it, what we are doing is beholding the masterpiece of Christ. We’re not saying what Christ did wasn’t enough; we’re looking at the fullness of the finished work of Jesus Christ, which is not reducible to individualistic experience, not reducible to group conversions. It’s not reducible to fellowships of like-minded and like-experienced Christians who happened to have shared the same conversion experiences and they had the same sort of testimonies. The Church is what Christ has made it, and from beginning to end this worldwide family of God reflects the greatness of our Holy Savior. I want to hold up for you not what a human institution has done, not what the Popes have accomplished, not what the saints have done, but what Jesus Christ has done and what the Holy Spirit is doing. Because as the Church is the Body of Christ, so the Church has always taught, in accord with St. Paul, as the Popes have often said, that the Holy Spirit is the soul of the Church, which is the Body of Christ. We are made up of body and soul. We’re made up of body and soul, one person who is embodied as a soul. The Church is the Body of Christ; her soul is the Holy Spirit. It is a supernatural, divine, human organism. It is something so far above and beyond our capacity through the five senses to understand. The greatest philosophers using reason in the greatest ways cannot comprehend what Jesus Christ has done and is doing and will do through the Holy Spirit in the likes of sinners like you and me. That’s what I mean when I say that the Church is the object of faith, because the work of Christ can only be comprehended and grasped through the eyes of faith. The Church is the family of God. It is the New Covenant. It is the Body of Christ. It requires an awesome vision which we, living in an individualistic culture, have difficulty understanding. We don’t know what it means to be “family”. We don’t really know what it means to be “community”. We reduce it down to voluntary groups, where people band together because they agree together. Our families are breaking down at an incredible rate. So when we hear that the Church is the household of God, we can barely imagine how superior God fathers His family through Christ and the Holy Spirit in contrast to how poorly we do it. Faith elevates and enlarges one’s vision, for there are many truths beyond the power of reason. But the real test of faith comes not so much in adhering to the doctrines concerning a God whose 33-year-old crucified body you believe to be the God-man. Our faith is really tested, not so much in how much we adhere to the fact that Jesus, on the cross is not merely a 33-year-old Jew, but also the second person of the Trinity, that’s a real test of faith, but the final exam comes when we look at the Church which prolongs the scandal of how God can take humanity and shape it and make it an instrument for salvation. The real test comes in when we look at the Body of Christ, which is 2000 years old, the Church that is full of sinners like me, and believe that this is Christ’s Mystical Body. 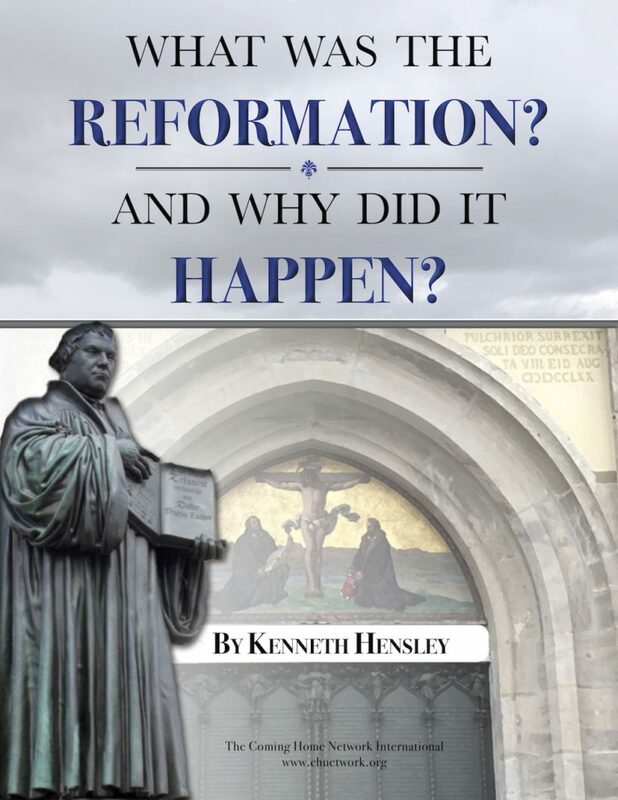 Back then, His individual body had dirt and grime in the wounds, and certainly today, the Mystical Body of the Church has dirt and grime, as well. Exhibit “A”. But the Holy Spirit is doing a work, which, at the end of time we will fall flat on our faces and marvel at. And He’s doing it through the institution of the Catholic Church that He has established in His own Body and Blood and through the twelve Apostles and through their successors. Pope Pius IX writes, “The true Church of Jesus Christ was established by divine authority and is known by a fourfold mark, which, we assert in the Creed, must be believed and each one of these marks so clings to the others that it can’t be separated from them. Hence it happens that that Church, which truly is and is called Catholic, should at the same time shine with the prerogatives of unity, sanctity and apostolic succession. Therefore, the Catholic Church alone is conspicuous and perfect in the unity of the whole world and of all nations, particularly in that unity whose beginning, root and unfailing origin are that supreme authority and higher principality of Blessed Peter, the Prince of the Apostles and of his successors in the Roman Chair. No other church is Catholic except the one which, founded on the one Peter, grows into one body fitly joined together, as St. Paul describes in Ephesians 4, in the unity of faith and love.” So says Pope Pius IX. He’s telling us that these four marks must be believed and they must be recognized as being the work of Jesus Christ through the Holy Spirit in the Body of Christ. Now, I want to move on from this notion of the Church as an object of faith. I want to move on to understand the Biblical basis for understanding the Church to be the Mystical Body of Christ, for being, in a sense a divine and supernatural organism. Let’s take a look at some of the key texts that deal with the Church and that deal with what Christ is doing. In John, chapter 10 and 11, Our Lord says, “Other sheep I have that are not of this fold, them also I must bring, and there shall be one fold and one shepherd”. He’s talking about Himself being a shepherd and He is visible. He’s talking about the fold of sheep, and the sheepfold must be one, and He is the one who makes it one through the Apostles. Caiaphas, the High Priest, goes on to prophesy that Jesus should die for the nation, but not only for the nation, but to gather together in one, the children of God that were dispersed. Elsewhere in John, in chapter 17, we have Christ’s high priestly prayer where He prays to His Father, “Holy Father, keep them in Thy name whom Thou has given me, that they may be one as we also are one”. (Jn 17:11) Jesus’ oneness with the Father is an eternal, invisible and spiritual oneness. We’re not saying, “The Protestants say it’s invisible and spiritual. We say it’s visible and physical.” We say, “It’s spiritual and invisible and also physical and visible. It’s not either/or, it’s both/and.” Why? The answer is found in the Incarnation. Before the Incarnation, the synagogue, the Temple of the people of God in the Old Testament could not make the claims that we make for the Church of the New Covenant. It was the Incarnation that dramatically transformed the reality of the people of God. The Son, who was eternally and spiritually and invisibly one with the Father became visible and physical and human and in His body, He formed the New Covenant. And in His body, He incorporates us and unites us and He identifies His Church with His body and He describes Himself as the one who built the Church: “I will build my Church” (Mt 16:18). It’s His Church; He’s the builder; and just as the Father made Him visible and physical, so the Body of Christ is visible and physical and one with the supernatural unity that comes ultimately from the Trinity itself. The oneness, the body of unity between the Father and the Son, can you imagine that unity? It’s hard for me to find words to describe the love that I feel for my children. I can’t imagine loving other kids like I love these. May God give me the grace to love all with this love, but the natural bond of love and affection and solidarity that unites a father and son here below is so great and so indescribable; can you imagine what it is when you multiply by infinity and see it in eternity within God? And that’s the unity that Christ prays for the Church to have. And that’s the unity that the Church has! If that supernatural and divine power can hold together the molecules and the cells in Christ’s physical, individual body, then appearances notwithstanding, bad popes notwithstanding, lousy cradle-Catholics who drink and swear too much notwithstanding, that same supernatural divine power can hold the likes of us together in His family, in His body, the Mystical Body. Because of Christ’s work and also because of Christ’s prayer in John 17, so Paul says, “I appeal to you brethren, by the name of Our Lord Jesus Christ, that all of you agree and that there be no dissension among you, but that you may be united in the same mind and the same judgment.” It isn’t just a oneness in some emotional, experiential way. We’re not talking about a warm fuzzy fellowship. We’re talking about a supernatural bond of unity that holds together in one divine, Mystical Body, Chinese, Australian, African, Asian, European, yes, and even Americans! That’s the work of Christ. When you look at it, you say, “It has to be God.” Two thousand years old and in every inhabited continent, we have agreement that we are united in the same mind and the same judgment through Popes who have no armies. It has to be God! In 1 Corinthians 3, Paul tells us, “For we are God’s fellow workers.” What’s wrong with God? Can’t He get the job done Himself? Paul said, “We’re God’s fellow workers.” Now, why would God possibly need co-workers? Why would God need a co-pilot, an assistant, or a vice-president? I mean, He’s God! Why would God call anybody to be fellow workers, co-workers? Is God’s work not sufficient? God’s work is sufficient, and the fact that we are His fellow workers is His work, the fact that He can take measly crumbs like me and you and raise us up and make us children of God, sons and daughters of the Most High, His co-workers. He goes on to say, “We are God’s field, God’s building; we are God’s body.” God doesn’t need our help. He dignifies us by stooping down, condescending to our level and raising us up to participate with Him. I once saw this man trying to cut his front yard and this little kid who was getting in the way with his toy lawn mower. You could see the annoyance written all over his face. I wasn’t sure what he would do. I was curious to see, come the second lap, how the guy would resolve it. I figure, he would probably put the kid inside. The second time around I noticed that the man was holding the boy in his left arm, holding the mower with his right arm, while the two little arms of that boy were also on the handle of the mower. Now, the beam of delight on the kid’s face was great and understandable. He fancied himself his father’s co-worker, and he was a fellow worker with his father. But did he do it? Did the father elevate the son for assistance or to dignify and to glorify – to give that son the pride of participating in the work of the father? When the Catholic Church teaches that we must cooperate, it’s only because God operates so as to cause us, to enable us to cooperate. We are monergists; we believe that God’s work alone, from beginning to end is what enables us to cooperate. It’s what enables us to work out our salvation with fear and trembling. We merit, only because God’s work is so real in us. He is not a manager or a master. He is a father who raises up children and He shares His wisdom and His power and His love so that we can participate in His work. Is God’s glory robbed? His glory is manifested! How does the Father bring glory to Himself? By raising up and glorifying His children, empowering and teaching them. So, the fact is, our justification is our charter of freedom, our title of sonship. It is not just that we are acquitted criminals; it’s that we are renegades and prodigals who have been brought back home and have been filled with the spirit of sonship, so we cry, “Abba, Father – Papa, help me, give me your strength, give me your love, give me your wisdom”. That’s what the Church consists of – the children of God. We are God’s fellow workers, we are God’s buildings. Don’t you know that you, in the plural, y’all, as they say down South, don’t you know that y’all are God’s temple? He didn’t say that y’all are God’s “temples”. He says that you all are God’s temple and that God’s spirit dwells in you. “If anyone will destroy God’s temple, God will destroy him, for God’s temple is holy”, and God’s temple y’all are! “For just as the body is one and has many members, and all the members of the body, though many, are one body, so it is with Christ.” Do you catch that? It’s the Body of Christ. If the Church was an invisible, spiritual unity made up of Methodists, Episcopalians, Lutherans, Presbyterians and Baptists all equally sharing in the one Catholic Church, then what Jesus should have said and what Paul should have said is that we are the soul of Christ, because the soul’s invisible and yet unified. But the fact is that human life comes to us in bodily form, in visible appearances, in physical bodies. So the physicality, the embodied life of Christ in His own individual body is expanded and shared visibly and physically by means of supernatural grace in the Church. For by one spirit, we were all baptized in the one body. What is it that brought us into the Body of Christ? “I accepted Jesus Christ as personal Lord and Savior”; but that’s not what Paul says anywhere; not in any place, in any of his writings did he say, “because we accepted Jesus Christ as personal Lord and Savior and believe that He died for my sins and so on, that’s what made me one body.” He says, quite clearly, “By one Spirit we were all baptized into one body – Jews or Greeks, slaves or free – and all were made to drink of one Spirit”. What’s he talking about, baptism and drinking? He’s talking about communion and baptism — the two principal sacraments. Know that you are bodies of Christ and individually members of it. “For as many of you as were baptized in Christ have put on Christ” he says in Galatians 3, verse 26. “You are all one in Christ Jesus. And if you are Christ’s, then you are Abraham’s offspring, heirs according to promise.” “Peace and mercy be upon all who walk by this rule upon the Israel of God.” (Gal 3:37, 6:16) The Israel of God, what does he mean when he calls us “the Israel of God”? He goes on to say, as I mentioned before, that it is through the Church that the manifold wisdom of God might now be made known to the principalities and powers in the heavenly places. (Eph 3:10) The Church is so great, so much greater than the sum of its human members, so much more than the sum total of the natural powers that we collectively share, because it’s the work of Christ. Paul says it all in the next few verses, in Ephesians 3:14, he says, “For this reason, I bow my knee before the Father from whom His whole family in heaven and on earth is named,” is derived. We derive our life, our existence, our unity from God the Father. The unity that makes us one is the unity that has eternally bonded the Trinity as one. That oneness was in the Incarnate Lord’s individual body and that oneness is now shared in His Mystical Body, invisibly and spiritually, to be sure, but visibly and physically, as well, just as the Incarnation revolutionized history. One thing I should say, Paul’s use of this word “mystery” to describe the Church, theologians recognize – all theologians, Catholic, Protestant, whatever stripe. All theologians and Biblical scholars recognize that when Paul uses that word mysterion, mystery, he is describing something that cannot be known from human experience. It cannot be believed on the basis of the five senses alone or human reason. What is a mystery is a mystery of faith and it must be received by faith because it is only revealed by God. We would not know it to be true, except that God has stooped down and revealed it to be true. The ultimate mystery, of course, is the Trinity. But God is not just a Creator that we know exists; God is a Trinity, a family, Father, Son and Spirit. Family is not a human convention that we take and project onto God to domesticate the Deity, to make the unknowable somewhat known. Family is eternal and original in the Trinity and we are called to share in family laws and family life, to share in God’s life and God’s love. We can’t do it. Adam blew it, Noah blew it, Abraham blew it, Moses blew it, David and Solomon blew it. Every great Old Testament saint in the Hall of Fame blew it. Christ alone did it and does it and will do it for all eternity through His Body and Blood in His Mystical Body, the Church. He is the new Adam, the founding father of a new humanity. This work of Christ is a mystery. In Ephesians 5, Paul says, “We are members of His Body”; and then he quotes Genesis 2, “For this reason a man shall leave his father and mother and be joined to his wife and the two shall become one flesh.” This mystery is a profound one and I am saying that it refers to Christ and the Church. The nature of the Church and the relationship between Christ and the Church is a mystery of faith. It is known by faith. 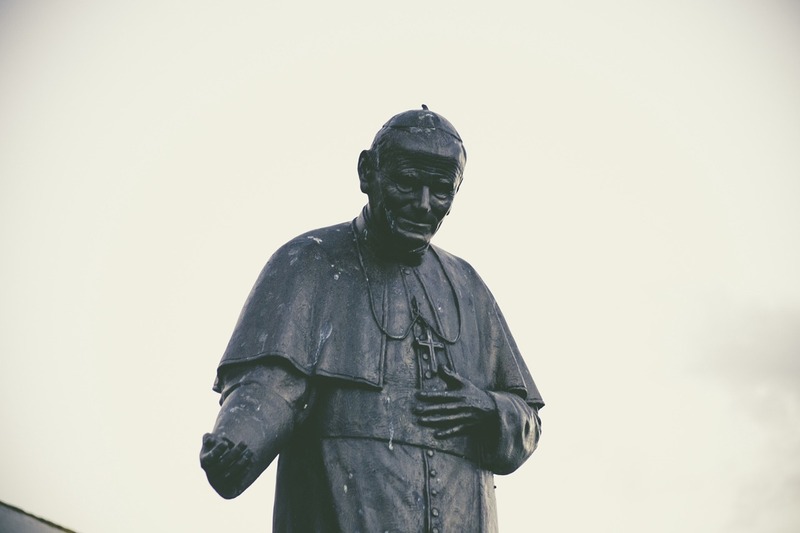 Non-Catholic conceptions of the Church are sociological. They are empirical. They are scientific. They are what the five senses coupled with human reason would give you, because there is nothing supernatural, there is nothing miraculous, there is nothing extraordinary about this church made up of people who conflict on almost every doctrine and almost every moral teaching and almost every liturgical practice. Then they say, “Well, we’re one because we confess the same Christ.” Well, then ask them, “Are the Jehovah’s Witnesses also one?” “Well, no, because they don’t think that Christ is God.” Then they confess that Christ isn’t sacred (if they are not one with you) because they don’t accept the deity of Christ, which took four centuries for the Church to hammer out. How ironic! How about the Mormons? Well, no, because they believe that Christ is a god — small g — as many other gods who have come before Him. Okay, so they are disqualified. So who decides what doctrines are so essential, what doctrines are so fundamentally important? Who decides whether you are or are not part of the Body of Christ? The Bible; but whose interpretation of the Bible? I tried that for years and it got me “split P” soup: The UP, the OP, the PCA, I was Presbyterian as a result of studying Scripture. I was a Bible Christian for years until I found the Bible leading me to seek elders or presbyteros. So I became a Presbyterian and I looked around to see what Presbyterian church to join, the UPC, USA, the PCUS, the OPC, the RPNA – it just went on. We called ourselves the split P’s. We formed one, big, unhappy split P soup family; and we’re not anything compared to the Baptists and the Lutherans and the Episcopalians and the Methodists, and they all continually split because sincere, misguided people are quite sure that the Holy Spirit has given them the right interpretation of the Bible on very important matters. Good night, what will it take? Every single covenant in the Old Testament was accompanied by a structure, a hierarchy, a family hierarchy where you had a father and under him elders and under them other rulers. You had King David and then his cabinet of ministers and you had elders who ruled over the tribes, just like back in the Mosaic ovenant, you had Moses and Aaron and you had the twelve princes of the twelve tribes and the seventy elders. All of these covenants formed unifying structures that would maintain and preserve and protect the unity of God’s family. That’s one of the most significant reasons for the covenants in the first place: to preserve the unity of the growing family, even to Gargantuan proportions, when the family becomes a nation or an empire or a worldwide body, as it is in the Church. So, the New Covenant that Christ forms, what is it? He goes about forming it in such a way as to recapitulate and perfect and complete all the Old Testament covenants. Just like Moses had twelve princes under him from the twelve tribes and he also had seventy elders, (or 72 elders if you included Metheldad and Medad) he had seventy elders underneath him, so Christ appoints twelve. Then Christ appoints seventy others according to the Gospel of Luke. Christ was calling disciples to reform and restructure a new Israel, an Israel that transcended race, and that transcended regions and geographical boundaries; and this third race is one, which by the way is the name of this talk. The third race is unified by Christ Himself. He is the covenant. He is the family. He is the means by which God fathers His family. The family of God is the master idea to the Catholic religion, if you want to understand how to grasp the whole, because the Catholic faith is so complex. One looks at the Pope and Purgatory and Mary and the Saints and you look at all of the rituals, all of the doctrines; how in the world can you make sense of it all? One idea, God’s family coming from the Trinity through Jesus Christ into the twelve apostles and their successors with the Blessed Mother, because what family is a family without a mother, and the saints as older brothers and sisters, role models to inspire us? All the whole kit and caboodle can be understood and summed up, that we are God’s family. I asked a theologian a few years ago as he was arguing and debating with me privately about these matters whether he thought the Presbyterian church or the Baptist church – whether you could call these “mother church”. He said, “Yeah, sure.” I said, “Is this mother church, is that mother church; are they different mothers?” “Yeah.” I said, “What do you call a man who fathers children through various mothers? Scoundrel? A jerk?” You know, whatever. That’s not the way God fathers. God fathers through one mother, Mother Church. God fathers His children in one family. He doesn’t father many families. And a father whose wisdom is infinite, whose power is infinite, whose love is infinite: Is his capacity to keep that family unified infinite? Yes! In its doctrine, yes; in its worship, yes; in its moral code, yes. Has He done so? Not according to non-Catholics. But the one, holy, catholic and apostolic Church testifies to the saving work of Jesus Christ, the glory of the new covenant, the family of God which He has fathered successfully, despite the fact that there are scoundrels in it to this day. God be praised. This fuller picture of the covenant that God’s family gives to us; this image that we are a family communion bonded through the sacramental oath that God has sworn through Christ; the covenant relations that established the Church are family relations. The Pope is our Holy Father. The priest is a holy father. Mary is to us a mother. Monks are brothers and nuns are sisters. Why? Because they all reflect and participate in the family love and life of the Trinity. That’s how the whole worldwide family of God is structured. That’s how it lives and is sustained, through the blood-bond renewed in Communion, through all seven sacraments, through the servant leadership of the Holy Father, Pope John Paul II, who is a living icon, a symbol of our real, ultimate eternal Father. We bow our knees before the Father in heaven from whom all fatherhood in heaven and on earth is derived. God the Father doesn’t do away with my fatherhood; it establishes my fatherhood. God the Father does not feel threatened in His fatherhood by my calling the priest “Father” or the Pope “Holy Father”. All of these people are signs and symbols pointing to us God the Father. That’s the nature of the Church’s hierarchy. Hierarchy comes from hieras arce, the rule of priests. Judges 17, 18 and 19 tell us that the Old Testament, the Biblical understanding of priest is fatherhood. This man asks for a priest and says, “Will you be to me a priest and a father?” He says it to his own son. He says to his son, “Will you be to me a priest and a father?”, because the priesthood is spiritual fatherhood. The whole priestly hierarchy of the Church is Christ establishing divine fatherhood in every level of human need individually, domestically; in terms of the parish, in terms of the diocese, in terms of the region and in terms of the whole worldwide family of God. This is how we understand our salvation. The word for redeemer in Hebrew, goel literally means “kinsman redeemer”. It was usually the oldest brother who did whatever it took to buy out of slavery or rescue from captivity his younger brothers and sisters. The redeemer, the goel was the nearest kinsman who would use the family wealth, the family power, the family know-how to rescue family members who were lost to the family. Redemption comes to us from the redeemer, from the first born among many brethren, according to St. Paul, Romans 8. Our redemption is the gift of family membership to us prodigals who have run away. Justification, according to the Catholic Church, is God conferring the gift, the legal and the actual reality of divine sonship. “Behold what manner of love the Father has given to us that we should be called the children of God, for so we are.” (1 Jn 3:1) We are the children of God. Now, if I made a statue of myself and it looked just like me, it wouldn’t be a child. If I had a child who didn’t look anything like me, he’d still be my child. What is it that makes a child? It’s the communication of my human nature. What is it that has made us God’s children? A legal decree alone? Not merely a legal declaration; the infusion of the spirit of sonship whereby we share in Christ’s own Sonship. We have an actual, physical, mystical, supernatural share in the Trinity’s family love and life. That’s what justification is. Sanctification is the spirit, the Holy Spirit of sonship, maturing the children of God in the family of God. Hebrews 12 talks about how God the Father disciplines us as children. Romans 8 describes a whole process of growing into Christ’s likeness as “maturing in sonship”. The glorification of the Christian and of the Church is a family fact. God the Father is going to glorify His family and each and every son and daughter that He has brought to Himself. Even the difficult doctrine of predestination is misunderstood when it isn’t tied directly to this master idea of God’s family. When Paul speaks of predestination in Romans 8 and Ephesians 1, both times he says, “He also predestined us to be conformed to the image of His Son that He might be the firstborn among many brethren.” The nature of predestination is sonship, not merely salvation, because salvation is the life in the family of God that belongs to sons and daughters who share in the Trinity. (Ephesians 1:5) “He destined us in love to be His sons, through Jesus Christ, according to the purpose of His will.” Salvation is the reality of divine sonship. Peter tells us, 2 Peter 1:4 tells us that He has made us partakers of the divine nature. We partake of the divine nature, not only individually, but what makes the Church one is the fact that all of the children of God receive the life of God and so from the family of God, and therefore, invisibly and spiritually and physically and visibly constitutes the extended household of faith. Praise be to our Father in heaven! If you were a father, what would bring you glory? What would bring you the most glory? Simply to declare sinners righteous when they still are sinful or to actually invest your own power and life and love and truth in them through the spirit of sonship, declaring and doing what you are declaring, imputing but imparting, making sons and daughters, making them righteous? What gives the Father the most glory? Many churches who all fight and squabble because they have no headship, no fatherhood, no family rituals, no family moral code, no family doctrines on which everybody agrees? What brings solo Deo gloria? What brings to God alone the glory, one Father, one family, one doctrine, one faith, one Lord, one hope, one baptism, one liturgy? Sure, there’s diversity. There’s the Byzantine rite, the Maronite rite, the Latin rite; but there’s one holy sacrifice of the Mass whereby God the Father calls His children to the family table to share the meal that His firstborn Son, our oldest brother has purchased for us. The is an edited version of a transcript of Dr. Scott Hahn’s audio and videotape presentation, “The Four Marks of the Church” as it appears in the Catholic Adult Education on Video Program.